We recently released version 14.09 with new compositing features. Compositing for a track on the timeline has been available for some time by clicking the C button in the track header. However, there was no way to control the size, position, and opacity of the video or graphic. This could have been made available earlier as a filter with a UI that simply uses sliders and numeric fields, but that is not fun to use! We wanted to provide a way to more directly interact with the video to adjust the size and position. 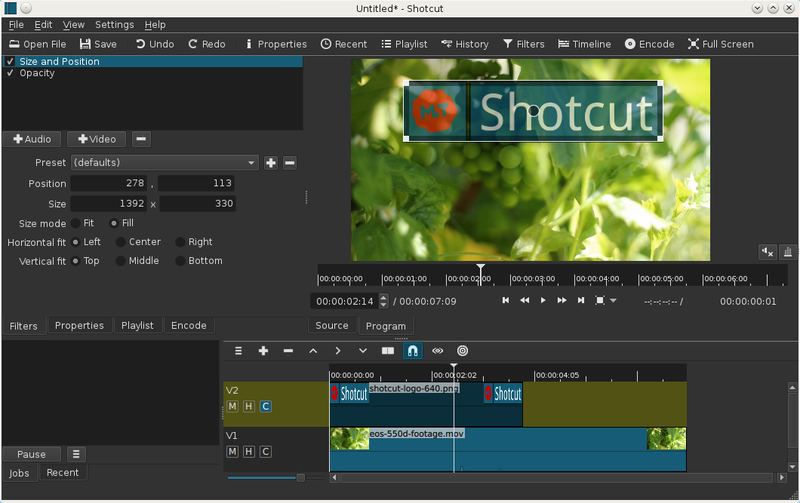 We needed to develop a new capability to overlay UI controls on top of the video using the same QML technology we use for the filters and timeline. Now that capability is available as the Video User Interface, or VUI for short. The new Size and Position and Text filters provide a rectangle control in the VUI. Added WMV and WMA encode presets. Enabled the video player zoom and pan controls for OS X. Added Size and Position video filter with a rectangle control that overlays the video player. Added a simple Text video filter also with rectangle control overlay. This is a dynamic text filter supports pre-defined variables: Timecode, Frame #, File date, File name. Enabled parallel video processing for Encode File on systems with more than 2 logical cores when not using GPU Processing. This makes encoding faster when using filters, transitions, and compositing. Added an Opacity video filter. Added an option on video fade filters: Adjust opacity instead of fade with black. Now you can add filters to an entire track by clicking the track head and using the Filters panel. New projects created with this version now load much more quickly.